If you love pumpkins, carve out some time this October to visit the Circleville Pumpkin Show in south-central Ohio. No matter how you cut it, this free 4-day festival is as much fun as the big, brightly colored vegetables it celebrates. First held in 1903, the event sprouted from a tiny jack-o'-lantern exhibit at the home of former Mayor George R. Haswell. Today it's Ohio's oldest and largest festival. Even the water tower in this small town looks like a pumpkin! We call it the ‘Greatest Free Show on Earth'. For 4 days, practically every available spot in an eight-square-block area of downtown is filled with food vendors, crafts, rides or games. About 300,000 people attend the festival, which features a veritable pumpkin patch of exhibits that showcase gourds, squash and other produce… flowers… artwork… and, of course, thousands of pumpkins. 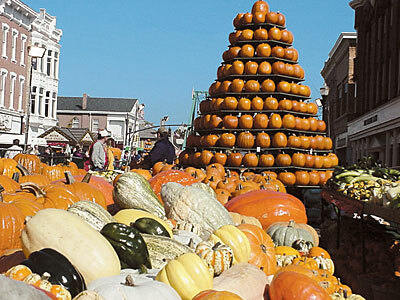 At the center of town, pumpkin growers construct a 30-foot-tall pyramid made of pumpkins–more than 100 of 'em! Another highlight is the pumpkin-growing competition. Last year's champion orange orb tipped the scales at an amazing 617 pounds! Be sure to bring your appetite and a sense of culinary adventure. Your taste buds will delight at the endless procession of pumpkin provisions. You can get everything imaginable made with pumpkin, including ice cream, fudge, pie, waffles, deep-fried pumpkin blossoms, chili–even pumpkin pizza and pumpkin taco salad! Speaking of food, you can see the world's largest pumpkin pie, which weighs 350 pounds and measures 5 feet across. It's made with 80 pounds of cooked pumpkin, 36 pounds of sugar and 12 dozen eggs, and takes 6 hours to bake. Now that's a pumpkin pie! Here's another scoop–visitors also can enjoy events such as parades, a carnival, pumpkin toss and pie-eating contests, and the Little Miss and Miss Pumpkin Show competitions, to name a few. Of course, you can buy a carved or painted pumpkin from one of hundreds of vendors lining the streets. You won't leave empty-handed! The Pumpkin Show starts the third Wednesday in October and runs through Saturday. Circleville is about 30 miles south of Columbus, at the junction of U.S. Highways 22 and 23. For more information about the festival, or for lodging suggestions, phone the Circleville Chamber of Commerce at 1-740-474-4923. Circleville is the birthplace of Ted Lewis, a famous clarinetist and jazz band leader in the 1920s and '30s. A museum devoted to Lewis is open Fridays and Saturdays from 1 to 5 p.m. Ohio's Small Town Museum, which features a delightful display of memorabilia, is in Ashville, a short drive north on Highway 23. Admission is free, but hours are limited; call 1-740-983-9864.